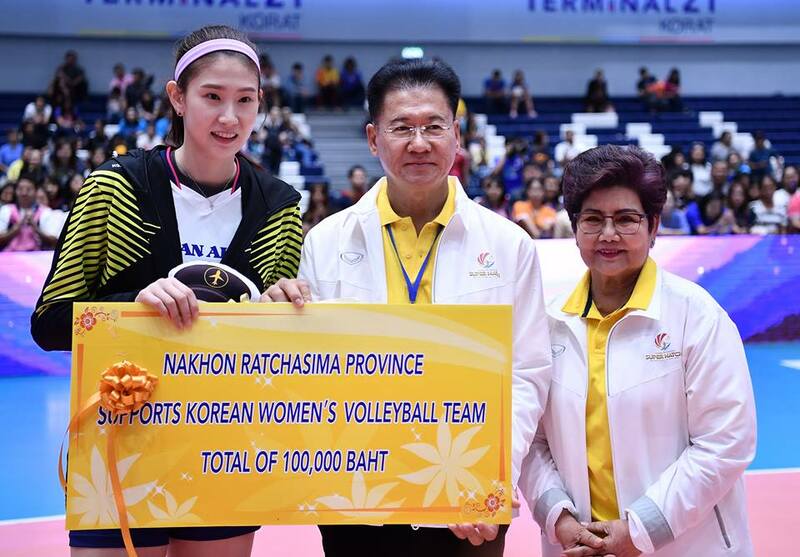 Nakhon Ratchasima, Thailand, April 5, 2019 – Thailand had a solid understanding of how player rotations system worked as the host side pulled off a hard-fought five-set (25-23 29-27 23-25 23-25 15-11) win over old foes Korea in their first game of the Korea-Thailand Pro Volleyball All-Star Super Match 2019 Presented by Mitsubishi Xpander at the packed Terminal 21 Korat Gymnasium here on Friday. 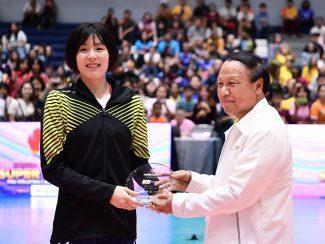 Thailand used the two-game All-Star Super Match as tune-up matches to seek highest potential players as line-up options to join Thailand women’s national team for different tournaments to be held later this year including the VNL, the Asian Senior Women’s Championship and the Olympic Qualification Tournament. 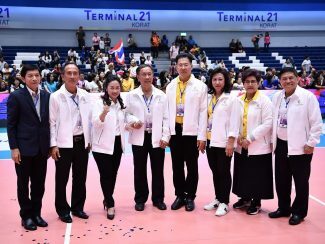 Therefore, all 14 players initially selected by the Thailand Volleyball Association to compete in this Super Match had been sent in the five-set thriller to sharpen skills and prove their talents. 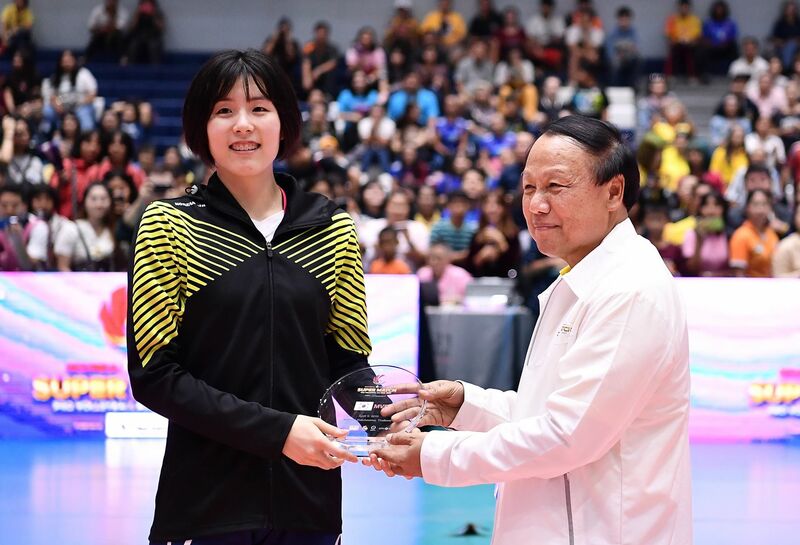 As the visiting Korean side were playing without their key player Kim Yeon-Koung, currently playing in the Turkish Women’s Volleyball League, Thailand head coach Danai Sriwatcharamethakul seemingly knew well how to build a truly functional team from this match. With their similarities and differences, it’s this unique mixture of young blood and old guard that keeps pushing the Thailand team forward. 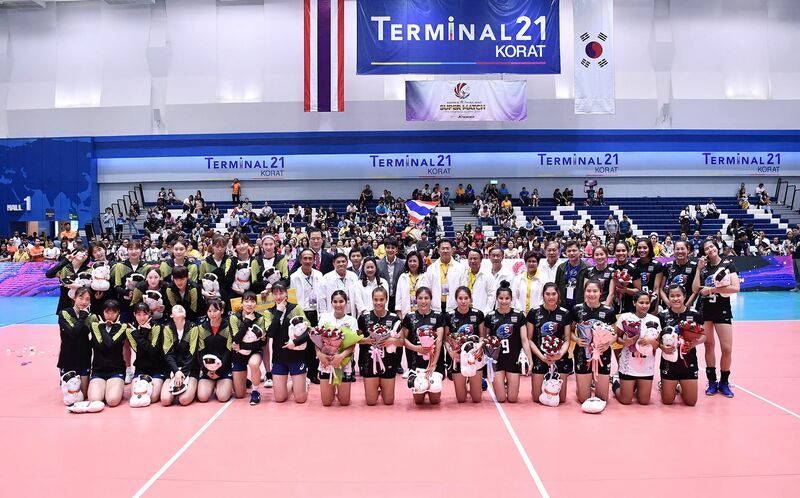 Veterans led by Onuma Sittirak, setter Nootsara Tomkom and Pleumjit Thinkaow joined the first-set lineups of the home side, strengthened by young guns including powerful hitter Ajcharaporn Kongyot, the 183cm-tall Chitaporn Kamlangmak and hard-attacking Jutharat Montripila, while Korea were also strong with the likes of Lee Jae-yeong, Kim Su-ji and Park Jeong-ah. Hosts Thailand obviously started slowly and were errors-strewn as the visitors peeled off some crucial points highlighted by the high-flying Lee Jae-yeong, who penetrated the Thai defence with her exceptional attacks. Trailing 11-16, the host side put their acts together, with Ajcharaporn and Onuma attacking devastatingly at the net to help Thailand even the score 21-21 and advance 24-21. 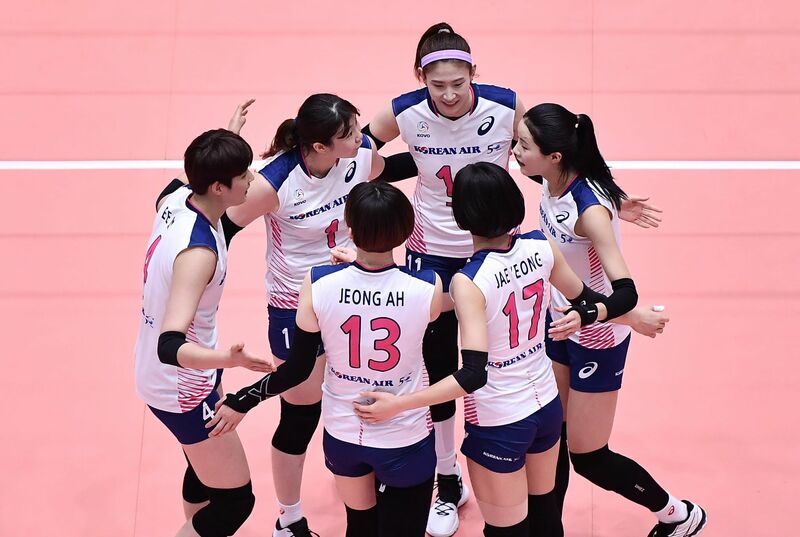 Korea saved two set-points before the host wrapped up the thrilling set 25-23. 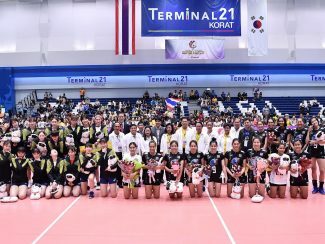 The Thai side shuffled their line-up a lot in the second set with Wanitchaya Luangtonglang, Thatdao Nuekjang, Amporn Hyapha, setter Kullapa Piampongsan and two veterans Wilavan Apinyapong and Malika Kanthong being called in to strengthen their defence. Still, Thailand started the second set in the same fashion as they trailed the Koreans at half-way. Thailand caught up with the visitors at 17-17 and broke away after that to take a crucial 24-21 lead, needing only one more point to win the set. 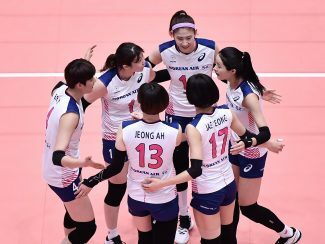 However, Korea never gave up easily as they fought tooth and nail to save six set-points before Thailand held their nerves and won two points in a row for the eventual 29-27 win to stretch the lead to 2-0. Thailand’s overwhelming dominance continued in the third set through a fusion of skill and brute force. In fact, the host team were a side packed with talents, but too often they suffered from errors and a lack of communication when the going got tough. That was why they were overtaken easily after leading 19-16. Lee Jae-yeong and Park Jeong-ah gave Korea a strong comeback to meet Thailand at 20-20 and remained in that aggressive form to win the action-packed battle 25-23. 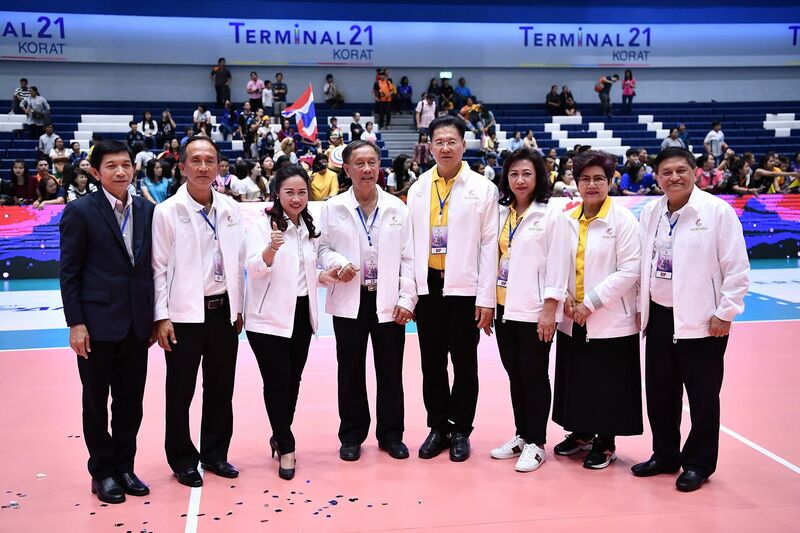 Thailand stood a chance of winning the fourth set and the match as they fielded a strong line-up, all of them competed in the team which picked up silver medal at the last year’s Asian Games volleyball tournament in Indonesia. They took a commanding 22-19 lead. Unfortunately, they just let the chance slip through their fingers as they became prone with unforced mistakes and Korea regained their composure for the comeback 25-23 win, forcing the host side into a decider. The rhythm was with Thailand in the tie-breaker as Ajcharaporn and Pleumjit unleashed on several powerful blows to help the host team win the fifth set 15-11 and match. “I would like to thank all my team-mates who helped bring a success to our team. It was our first time to play as a full team this year since we have just completed playing with our own clubs in professional leagues. We had a short period of training together, but we played with all we had. It was a good match against Korea and both sides tried to give their best, resulting in a very close match. 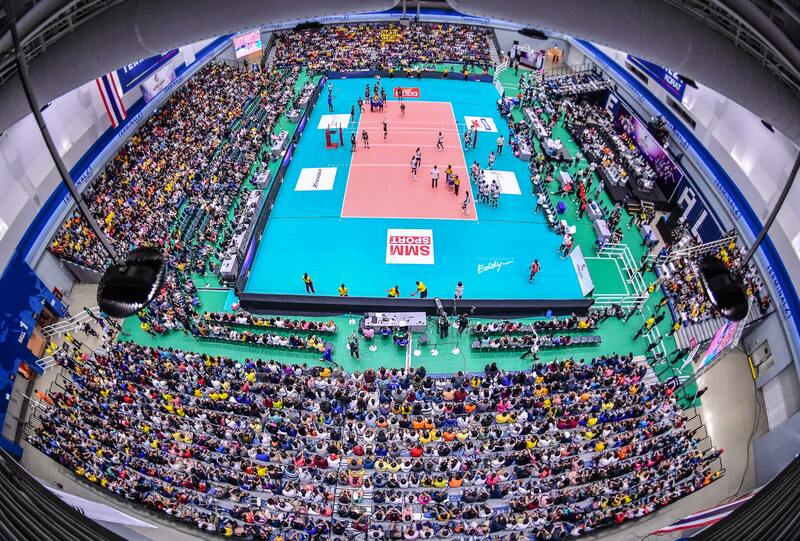 Spectators at the competition venue tremendously supported us, making the game even more entertaining and exciting,” said the newly-appointed captain Nootsara Tomkom. “However, both veterans and young players were fielded to play this match. It’s necessary that we need team adjustment since all players in our team came from different clubs. Therefore, we have to figure out the right formula and the same format of play for players who are playing in the same team because we have to make sure we are playing the same format ahead of our tougher world-class tournaments later this year,” added the highly-skilled setter. Team-mate Wilavan Apinyapong credited the team’s success to every player in the team and huge supports from volleyball fans at the competition venue alike. “I think Thailand and Korea came up with all-out efforts. Both teams tried to shuffle their line-up to allow players a chance to play. As far as I’m concerned, this is not a true friendly match as both teams fought hard to win the match. It’s a good match and players can learn from each other. I would like to thank die-hard fans from my hometown Nakhon Ratchasima who turned out at the venue to its full seating capacity. 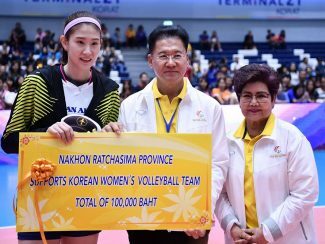 They always did not let the visitors down in terms of hosting any volleyball tournament in Nakhon Ratchasima,” Wilavan said. 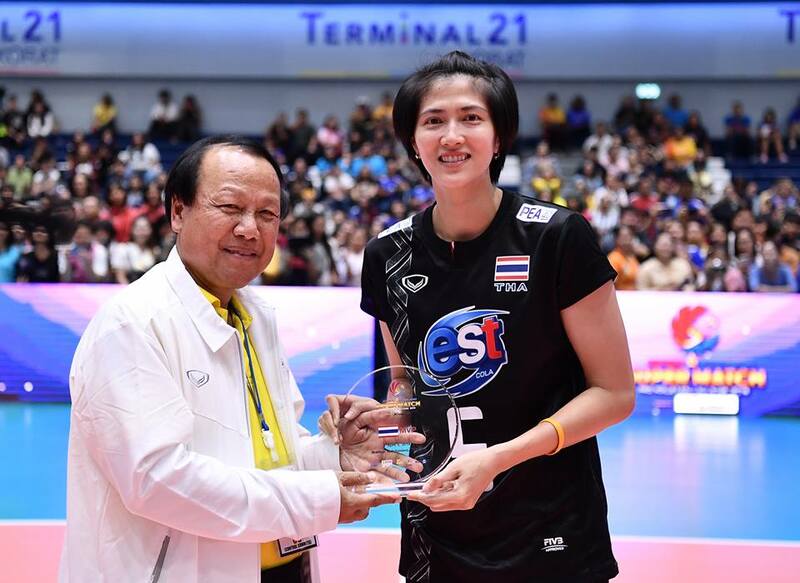 Mr Somporn Chaibangyang, President of Thailand Volleyball Association, presented MVP plagues to Thailand’s Pleumjit Thinkaow and Korea’s Lee Jae-yeong. Players of both teams also received mascot dolls and bouquets of flowers. 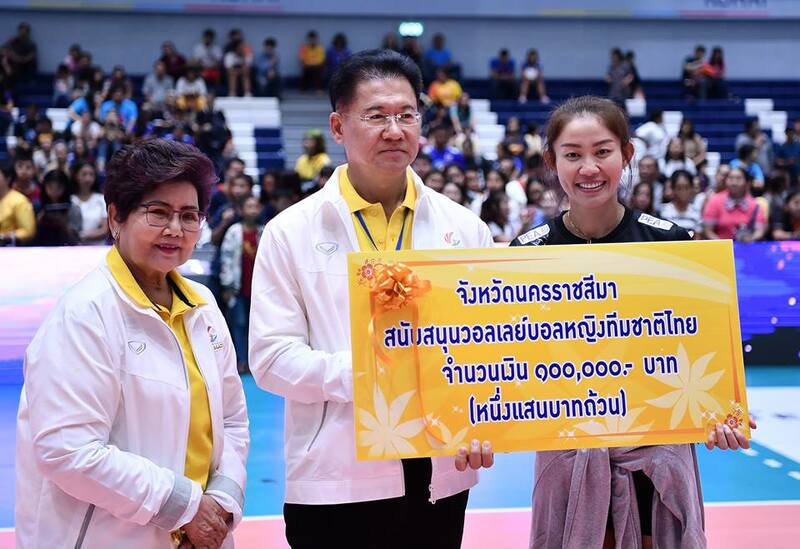 On behalf of the host province, Nakhon Ratchasima Governor Mr Wichien Chantharanothai presented supporting money totalling Bt100,000 apiece to both teams. 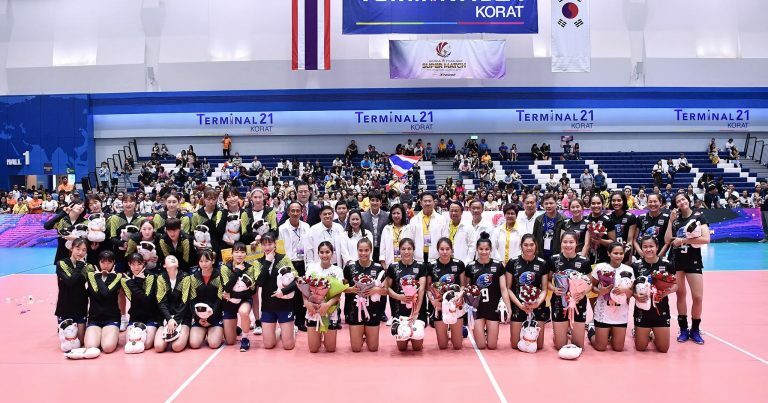 The second match of the Korea-Thai Pro Volleyball All-Star Super Match 2019 Presented by Mitsubishi Xpander will take place at the Hua Mark Indoor Stadium in Bangkok, Thailand on Sunday, April 7, 2019 at 14.45pm local time. 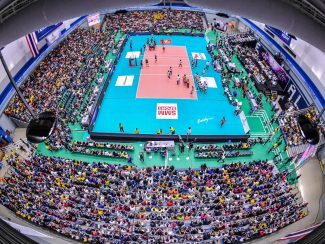 The volleyball exhibition game was first played in 2017 at Hua Mark Indoor Stadium in Bangkok, where hosts Thailand went down 2-3 to Korea. A year later, the Thai team avenged the loss by narrowly beating hosts Korea with the same margin 3-2 at Hwaseong. 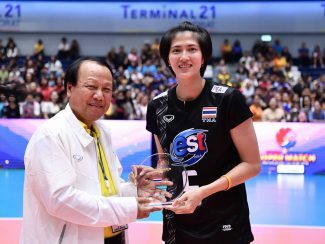 The Friday’s win has already improved the Thailand’s win/loss record against Korea to 2-1 in the All-Star Super Match event.